Because this is a match play tournament certain numbers are not compatible with the event. To guarantee a spot please register early. If you are the 17th person to register-you got to find an 18th or the event has to run with 16 people-so register early to guarantee a spot! Also note Registration ends Friday August 30th at 8pm. If you register and pay but have to drop out you can get 100% of your $$ back as long as its within a reasonable time before the Friday night where registration ends. I will announce the cutoff date to drop out later in the summer. Players will be grouped into equal pools and play a round robin format vs the other players in their own pool. Pools will be made up of either 4 or 5 players, (depends on numbers). Players can expect to play 36 holes of matchplay on Saturday. It will be either 3, 12 hole matches or 4, 9 hole matches for all. Players will play a mix of longs and shorts at Camp fortune. Players will get 2 pts for each win 1 pt for each tie and 0 pts for each loss. The entire field is sorted in order based on pts-highest to lowest(with tiebreakers). A standard playoff tree is made-players are seeded based on points. The tree will be made so that by round 2 it is "symetrical". So in other words if there are 20 players, round 1 playing a match will be seeds 20th to 13th so that in round 2 there are 16 people in the playoff making the bracket symetrical. Putting this out there because there is a chance 2 or 4 people might have to play round 1, of the playoff. Playoff matches will be either 9 or 12 holes in length. By Saturday afternoon that will be decided. Win and your still in--lose and your done. How Long will it take to play this tournament?-All day Saturday at least, and by noon on Sunday half the field will have compleed the event. Keep in mind also that Monday is a holiday. Yes your reading it right, 6 or less 100% of the field gets paid out. For out of towner's I have space in my back yard to camp. 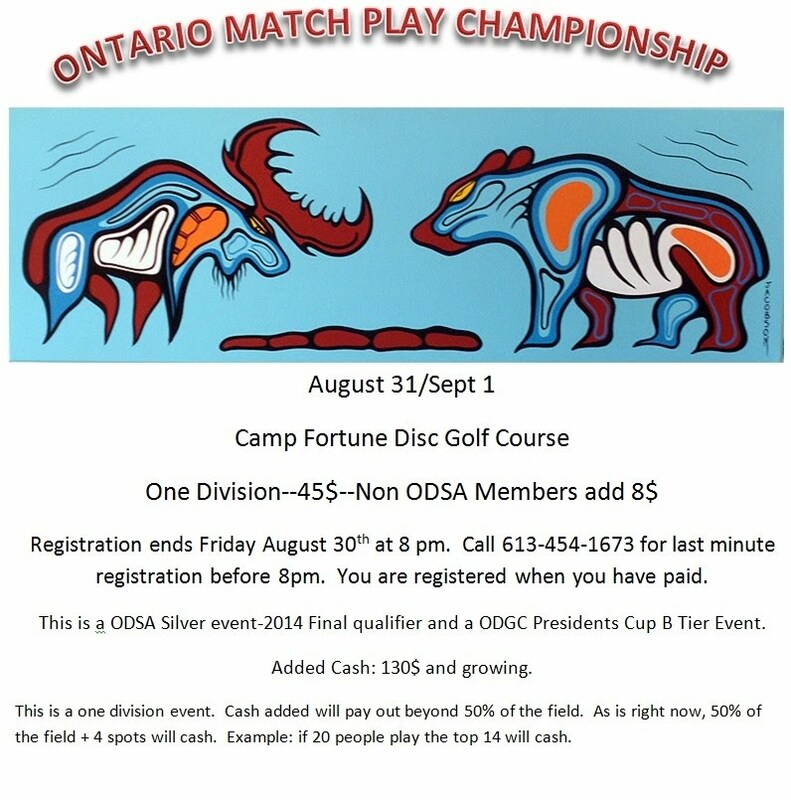 ODGC members--Club Bux will be accepted. Am I reading the poster right; we have to be registered by this Friday? Registration ends Friday August 30th at 8pm. Registration ends Friday August 29th at 8pm. Why are you only using the short tees? Going to be a busy year on the Mountain. We're up to 6 tournaments this summer and still the plaid to be decided upon. Maybe lucky number 7. Is there a discount for those that were in the league? Or: does one have to have been in the league to register? 12 days left to register. 4 days left to register! !